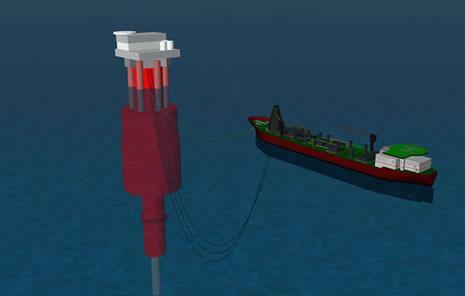 Offshore OTEC ammonia producing plant offloading ammonia to a tanker. The common thread running through all areas of Makai’s expertise is high-caliber engineering research and design. Makai has provided research, design, and project management services for clients who range from aquaculture farmers to the largest defense contractors in the world. In addition to the completed projects described below, we regularly assist our clients by performing research in new and emerging areas of technology. Makai performs submarine telecommunications and power cable planning, model simulation, and monitoring during the at-sea operations. Makai designs marine outfalls and diffusers and has the experience to provide innovative solutions to difficult problems, such as extreme seafloor slopes and suspended pipelines. Makai has extensive experience designing and testing the large heat exchangers used in marine applications such as seawater air conditioning and ocean thermal energy conversion. Makai operates a large research facility where heat exchangers designed by Makai and others are tested for performance and corrosion using surface and deep seawater. Makai performs project management and oversight for marine and terrestrial construction and survey projects dating back to the 1970s. A Launch, Recovery and Transport vehicle used to support the University of Hawaii’s Pisces V submersible. This diver controlled underwater LRT can safely launch and recover the Pisces in very rough seas. Makai designed the all-aluminum vehicle, oversaw the construction, directed the testing, and obtained ABS certification.